These 10 apps, all of which are compatible with iOS 3.0 and higher, are among the best out there for working with others. Best of all, most of them leverage the cloud to let you shift seamlessly between your phone and your desktop as you move in and out of the office. To do any significant work on an iPhone, you have to get around one major limitation: By design, third-party apps can't share data with other apps. That's why, for instance, you can't open e-mail attachments in anything other than the Mail app's built-in viewer. Fortunately, there are plenty of clever programmers who have designed their apps to use the online storage and sharing services Box.net and Dropbox. As long as you have an account with one of those services, you can access and save files there. Each of these storage services also offers an iPhone app of its own that lets you manage your stored files by, among other things, organizing, sharing and setting permissions for them. View, share and comment on stored files with Box.net's iPhone app. Box.net has long been a popular online file storage service, and it gets better and better with each update. When you access the site on a computer, you can edit files with Zoho's full-featured Web 2.0 office suite, use third-party plug-ins and much more. The Box.net app is free; Box.net's free individual account offers 1GB of storage, with 10GB accounts starting at $9.95 a month. Dropbox offers a different approach to file sharing, letting you sync files among your Windows, Mac and/or Linux computers and the Web, where you can share the files with others and monitor their changes. Dropbox creates a folder for automatic syncing on your computer(s). If you change any files in that folder or add any files to it, those changes will sync to other designated dropboxes. You can create private subfolders that sync among your own computers, as well as shared subfolders that sync to clients, partners, teammates or anyone else you designate. The Dropbox iPhone app lets you manage shared files from your phone. As with the Box.net app, the Dropbox iPhone app lets you manage your shared Dropbox files from your phone. You can assign files to team members or other collaborators and see when a file has been viewed or updated so you can keep up with what your teammates are doing. You can also use the app to view files others have shared with you, but you can't directly edit them or upload files of your own, except photos and videos from the Camera Roll. (Later in this story we'll look at some iPhone apps that let you download, edit and upload files to and from your Dropbox account.) An Events view in the app highlights whenever a file has been added or modified. 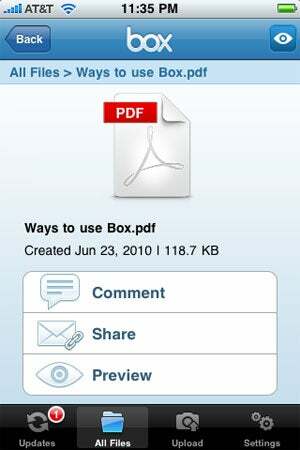 The Dropbox app is free; Dropbox accounts offer 2GB of free storage, with paid accounts starting at 50GB for $9.99 per month or $99 per year.